As an ArtPrize visitor, you get to decide the winners of $250,000 in cash prizes, including the $200,000 Public Vote Grand Prize. Your votes, cast via smartphone on on your computer, are a powerful force at ArtPrize — elevating artists from among the 1,260+ entrants to a set of finalists, and ultimately awarding the world’s largest art prize. First and foremost, you are absolutely qualified to vote at ArtPrize — regardless of your background, education or experience. Art needs you, and your opinion. You don’t need a degree in fine arts or art history to decide what you like and don’t like. Artwork is created for you to respond to, and at ArtPrize, your response counts. Did the artwork move you? Did it grab your attention? Did it make you feel anything? Did it spark a new conversation or foster new understanding? Would you hang it in your home? Do you just... like it? But don’t just take it from us — the art critics agree! 2. It’s scientifically-proven to enhance your visit. Our visitor surveys have confirmed what we suspected to be true! Those who cast at least one vote during their visit to ArtPrize have a nearly 50% better experience than those who don’t. When you vote, you tend to see more art during your visit and connect with each piece on a deeper level. So if you’re looking for ways to enhance your experience at ArtPrize Nine, why not give voting for art a try? It’s as simple as downloading the ArtPrize mobile app, free for iOS and Android, or stopping by the ArtPrize Visitor Pavilion to sign up. 3. It doesn’t happen anywhere else. 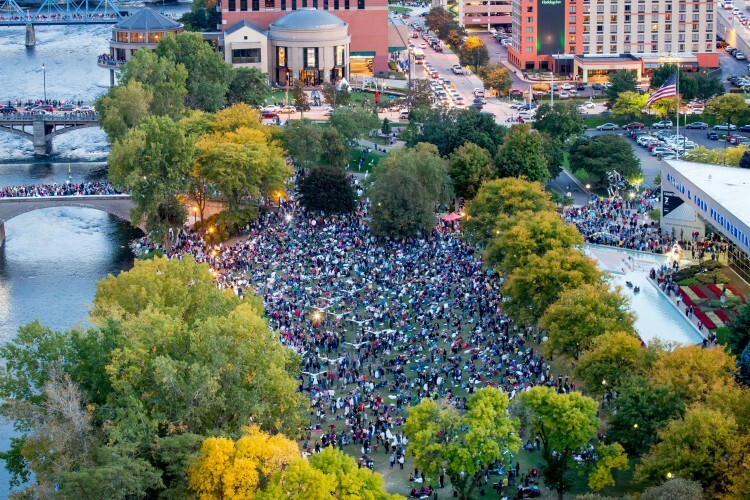 The public vote at ArtPrize sets this event apart from other art events, biennales, fairs and festivals that happen around the world. At no other event of its kind are visitors empowered to award the top prize. The public vote, giving a voice to the masses, has been a central tenet of ArtPrize since its inception in 2009 — flipping the traditional, top-down model of the art world on its head. 4. It shines a spotlight on amazing artists. Being nominated as a finalist and winning a prize both elevate ArtPrize artists into the national spotlight. Many past ArtPrize public vote winners have launched or strengthened their careers because of the exposure your votes brought to their work. 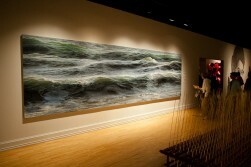 Ran Ortner, winner of the first Public Vote Grand Prize in 2009 for his work “Open Water no. 24,” went from not being able to pay his phone bill prior to participating in the event, to seeing his work in The New York Times, the Wall Street Journal, BBC and NPR Studio 360. Since then, he’s had his work featured as the visual centerpiece of Le Bernardin and for the United Nations’ World Water Day; one of his works is permanently installed at 7 World Trade Center; and in 2016, he opened a solo exhibition of paintings at Robert Miller Gallery in New York. 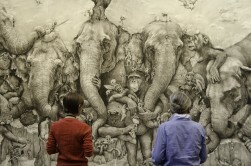 Adonna Khare’s “Elephants” captured hearts and imaginations at ArtPrize 2012, winning the Public Vote Grand Prize. Following that win, she was one of the 102 artists featured in the 2014 State of the Art: Discovering American Art Now exhibition. Most recently, ArtPrize donated “Elephants” to Crystal Bridges Museum of American Art, where the renowned museum took it into its permanent collection, and featured it as the centerpiece of its Animal Meet Human exhibition. Her work has been featured in the Los Angeles Times, NPR, The Huffington Post, Daily Mail, Juxtapoz Magazine, and Mashable, among others. Anila Quayyum Agha, winner of the ArtPrize 2014 Public Vote Grand Prize and co-winner of the 2014 Juried Grand Prize, left visitors in awe with her piece “Intersections,” which was installed at the Grand Rapids Art Museum. Since winning $300,000 at ArtPrize, “Intersections” has been travelling the world, showing at the Dallas Contemporary Art Museum, Rice University Gallery, and Sharjah Contemporary Art Museum in the UAE. Agha has also shown in New York City and New Delhi, India, and has several upcoming shows across the country in 2017 and 2018. Keep elevating the artists you love at ArtPrize Nine by voting for their entries! Download the ArtPrize mobile app, free for iOS and Android, and then head to artprize.org/vote to learn more about voting at ArtPrize, including how and when to cast your votes at the tenth annual event,.